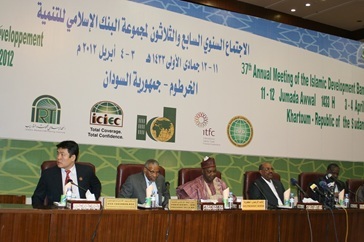 The 37th Annual Meeting of the Islamic Development Bank (IDB) Group, took place in Khartoum, Republic of the Sudan from 31 March - 4 April 2012. The meetings of the Boards of Governors and General Assemblies of entities of the IDB Group took place on 3 – 4 April 2012. Apart from these meetings, seminars, workshops, and other fora on specific topics of interest to IDB member countries also took place during the Annual Meeting. Important highlights from IDB Group annual meeting are the followings. President of the Republic of Sudan, Omar Al Bashir, officially inaugurated the 37th Annual Meeting of the Board of Governors of the IDB at the Friendship Hall in Khartoum, on April 3, in the presence of Ministers of Finance and Economy and Planning of the 56 member countries of the Islamic Development Bank Group as well as official guests representing various entities of the member countries. The annual symposium on Inclusive Development held on the occasion of the 37th Annual Meeting of the IDB declared that no nation could aspire to achieve balanced, sound and sustainable economic growth without inclusive development of its citizens regardless of their racial, religious, tribal and ethnic divides. The symposium also reiterated that economic development needs to be people-oriented helping to bridge the social, gender, ethnic, racial and religious divides and with its benefits particularly reaching those marginalized and vulnerable people in the society. The symposium was chaired by Mr. Ali Mahmoud Abderrasool, Minister of Finance and National Economy of Sudan and the panelists were Ali Babacan, Deputy Minister of Turkey, Mr Riadh Bettaieb, Minister of Investment and International Cooperation of Tunisia and Mr. Bambang, Head of Fiscal Policy Office at Indonesia’s Ministry of Economy. The symposium provided ground for a discussion on funding for agricultural investment and the exchange of knowledge among decision makers and investors. The speakers stressed on the need for strong political will to address the problem of food security, water scarcity, etc. and emphasized that special attention need to be provided in the areas of fish farming and meat production. With a view to continually promoting youth involvement in the socio-economic development of member countries, the IDB Group organized the first international seminar on “Youth Development” on the occasion of its 37th Annual Meeting in Khartoum. The seminar witnessed two international experts and a number of youth representatives as panelists from different parts of the world share their ideas and concerns on the challenges faced by the younger generation and opportunities open to them in today’s world. The experts presented their views on “The State of the Youth in OIC Countries” and "Successful Models of Tackling Youth Unemployment”. The youth panelists interacted with the experts bringing their regional, organizational and professional perspectives on these topics from their respective backgrounds in countries like Sudan, Pakistan, Indonesia, Uganda, etc. The Forum provided a platform for strategic policy dialogue and sharing the experiences of countries and institutions towards the development of the various segments of the Islamic Financial Services Industry. It attempted to identify key challenges to the industry's development in an integrated manner, promoting cooperation and knowledge sharing, thus enhancing its competitiveness and stability. The Forum discussed two major items: (i) the potential role of Islamic Finance in job creation in the economy and (ii) how Islamic Finance is contributing to the Process of Job Creation in the Economy. The Focus Group meeting on Disaster Risk Management for OIC countries took place on April 2 on the sideline of the 37th Annual Meeting of the IDB in Khartoum, Sudan. The meeting was attended by the representatives of IDB, SESRIC, UNDP, OIC General Secretariat, and Disaster Management and Refugee Studies Institute (DIMARSI) of International University of Africa. The main objective of the meeting was to discuss and finalize the outline of the Disaster Risk Management Strategy for OIC countries. The meeting also discussed other issues related to the preparation of the strategy, such as the resources, validation, review and timeline. Following general discussions and debates on all these issues, the participants encouraged adopting a developmental approach in producing the document and also emphasized the importance of capacity building. The representative of the UNDP expressed the willingness to work with SESRIC and IDB in preparing the strategy document, particularly in adopting existing tools and methodologies to respond to pre-disaster and pre-conflict context. Likewise, the DIMARSI expressed the willingness to cooperate with SESRIC and IDB in preparing selected country case studies, regional case studies and thematic studies. The participants also appreciated the initiative by SESRIC and IDB to organize a side-event on the subject during the UN Conference on Sustainable Development to be held in June 2012 in Rio, Brazil.